Graduate student Jessica Guo is passionate about science education. And she has lots of experience teaching coding and big data. Guo combined passion and experience to present a weeklong workshop on big data to students from Mesa Public Schools. “Programs like this one are narrowing the gap in girls’ participation and success in math and science,” said Monica Elser, education manager for ASU’s Julie Ann Wrigley Global Institute of Sustainability. According to Guo, the primary goal of the workshop was for girls to develop coding skills while learning to work with large, publicly available datasets. “In my experience teaching grad students and undergrads, learning to code in R has a steep learning curve, so I was really impressed with this group of girls and their persistence,” said Guo. “The workshop capitalized on a broad range of data and ASU resources to create something really special for these students,” Elser said. 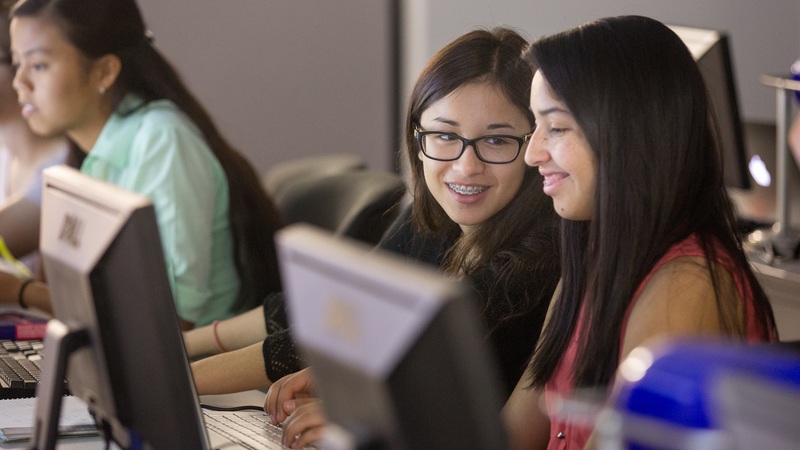 ASU grad student Jessica Guo (center) looks over coding with senior Theresa Ruiz (right), 18, as Yazmin Flores, 17, also works on the pair's project in the “From Big Data to Big Ideas” workshop. Doctoral student Guo, who grew up in the Mesa Public Schools districe, received a NASA Space Grant fellowship to fund the weeklong project. Senior Angelica Pangan, 17, helps Danijela Covo (left), 16, with coding during the data workshop Oct. 16. More than a dozen juniors and seniors gave up part of their fall break to compile, organize and utilize weather data over a 29-year period. Sixteen-year-old Diana Kwiatkowski discusses New Mexico air temperatures during Guo's workshop. In addition to long-term weather data from the Jornada Basin Long-Term Ecological Research program in New Mexico, the students analyzed atmospheric CO2 data from Mauna Loa in Hawaii and precipitation data from the Flood Control District of Maricopa County in Arizona. Seventeen-year-old Madeline Moore, shows the coding she and her partner, Diana Kwiatkowski, did on their analysis of air temperatures in New Mexico during the workshop. ASU grad student Jessica Guo applauds two students' report during the “From Big Data to Big Ideas” workshop Oct. 16. The students analyzed atmospheric CO2 data from Mauna Loa in Hawaii, precipitation data from the Flood Control District of Maricopa County in Arizona, and a long-term weather data set from the Jornada Basin Long-Term Ecological Research program in New Mexico. ASU’s Central Arizona-Phoenix Long-Term Ecological Research program was a partner on the workshop, which was part of Guo’s work with the ASU/NASA Space Grant, based in the School of Earth and Space Exploration. Guo is a doctoral student studying biology in the School of Life Sciences. Arizona State University is a member of the Arizona Space Grant Consortium, part of the National Space Grant College and Fellowship Program, which funded Guo’s workshop. "Year One: Life at ASU" is a periodic photo series following five freshmen navigating their first year at ASU. This installment checks in on Eric Arellano in the classroom setting. Eric Arellano is one of four students who show up for the first class of the Confucius Institute's Beginning Chinese on Sept. 10. Three, including Arellano, are Flinn Scholars who are taking the course to prepare for their three-week trip to China early next summer. Arellano learns the new sounds of letter combinations in his Beginning Chinese class — learning language can be a daunting task, but Arellano is eager for the challenge and dives into the class. Every student has a method to learning; Arellano shows us a bit of his technique as he writes the sounds of letters under the letters during his Beginning Chinese class. It's a way to reinforce the right way to pronounce the language. Beginning Chinese teacher Yi Wang goes around the room asking her students to pronounce letters. Arellano did well, consulting his notes — with the pronunciation marks — to show his evolving grasp of the language. Always eager to learn, Arellano studies the letter sounds on the first day of Beginning Chinese class. He hopes to have a grasp of the language by next summer. Arellano came to Arizona State University to major in sustainability. But a few weeks into his first semester, the Tucson native has changed his major to computer science — though he'll still be minoring in sustainability. Here, Arellano sits among the students in his Principles of Programming in Java lab on Sept. 4. Teaching assistant Aditya Tangirala gives instructions during Arellano's Principles of Programming in Java lab. Arellano looks over his work in his Java lab. The Flinn Scholar is working toward a degree in computer science. His goal is one of altruistic entrepreneurship — to create a company that is viable and improves the world.